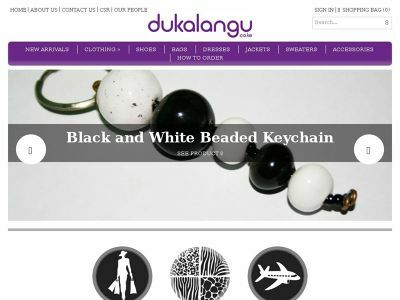 Dukalangu.co.ke is the new online shop in town. The internet start up, based here in Nairobi, aims to reach local fashion designers to sell their merchandise to fashion enthusiasts through a secure web platform. Customers can browse through the Dukalangu collection, place orders and get free deliveries of ordered merchandise to their homes and offices. The company was co-founded by Dennis Gichuki and Kevin Amateshe. “The idea of Dukalangu came about after we experienced difficulty trying to buy items online and we were disappointed. After doing some research we realized that an online platform such as Dukalangu could help promote goods and products especially for local designers through an online platform.” said co-founder Dennis Gichuki. The Dukalangu collection consists of handmade accessories, bags, shoes sourced from local designers and merchants. The merchants sometimes have their goods imported and use Dukalangu as an avenue to increase their sales. The service is currently being offered in Nairobi and the company plans to do expansion to major counties across the country in the next two years. “The e-commerce environment in Kenya is very enticing in the returns it has to offer. The growth we envisage as mobile use and internet use increase is likely to propel the business greatly.” said Mr. Gichuki.